Charlie Pescod was a diminutive left-hander who learned to play baseball in Panama and traveled to the United States to play minor league ball for six years before military service beckoned. Charles Redward Pescod was born on December 8, 1913, in Salinas, the westernmost city on the mainland of Ecuador in South America. His father, Henry, was English and a manager with All America Cables, and his mother, Agripina, was from Peru. The family moved to Panama in central America when Charles was young and it was in that country that he and his six brothers and five sisters grew up. Panama had strong links with the United States. The Panama Canal had been completed in 1914 and the United States was responsible for its administration, fortification and defense. Consequently, Panama was a hotbed of American sports, baseball in particular. In 1930, the dark-skinned southpaw entered Cristobal High School where, as a freshman, he joined his older brother, Tommy, as a forward on the varsity soccer team, played centerfield and batted number two on the baseball team, and also played basketball, tennis, golf, handball and volleyball. His sophomore year saw him still playing on the soccer team as a forward (Tommy was team captain that year), while also running track, playing football, basketball, tennis, and captaining the golf team. He was a star as an outfielder and pitcher for the baseball nine (Tommy was the baseball captain). Cristobal High School entered a team in the highly competitive Twilight League for 1931/32. Pescod made his pitching debut in the league on December 18 and beat DeLesseps, 8-1. On January 8, he allowed just three hits beating United Fruit Co., 2-0, and bettered that on the 12th throwing a one-hitter against the Postal Clerks. On February 1, he again beat the Postal Clerks with a one-hitter by a score of 3-2. On February 4 he threw a one-hitter against the Post Office. On March 5 he hit back-to-back homers against the Automats and later in the month Cristobal High School clinched the Atlantic Side Twilight League title. In 1932, Pescod captained the soccer team, played tennis and basketball, and pitched the ball team to its second consecutive high school baseball championship. Pescod’s senior year saw him playing baseball, soccer, basketball and tennis. In 1934, Pescod was a member of the Panama national team that played Nicaragua and he went on to star with the Colon and Cristobal teams in Panama's Isthmian League, setting a league record by striking out 17 batters in a single game. He was league MVP in 1935 with an 8-1 record and 2.25 ERA. In 1937, Paul Richards, then manager of the Atlanta Crackers of the Southern Association, saw Pescod playing ball and persuaded him to come to America for the 1937 season. This move would make him probably the first Panama-based player to play organized baseball in the United States and almost definitely the first Ecuadorian to play. He moved up to Class B baseball in 1939, joining the Rocky Mount Red Sox of the Piedmont League. “Charlie Pescod . . . cut another notch in his victory string last night as he turned in his second straight five-hit game and hit a homer to lead his mates to a 3-2 victory over Norfolk,” reported the Burlington (NC) Daily Times-News reported on May 26. On June 9 he held the Charlotte Hornets to three singles and knocked out a home run and a double. He was 15-10 with a team-leading 131 strikeouts in 227 innings for the year despite missing a month of the season due to arm trouble. "Pescod's work was remarkable enough in itself," declared Scranton manager Nemo Leibold after the game, "but it was more so in view of the fact that he had arm trouble this spring and hadn't pitched in a game, not even an exhibition. That was his first start." Despite this sensational start, Pescod struggled on the mound in a handful of appearances and was optioned to the Montgomery Rebels of the Class B Southeastern League in June. Still struggling with an ailing arm, the 25-year-old’s record dropped to 4-5 in 22 games with a 4.88 ERA. One consolation, however, was his .324 batting average. Pescod began the 1941 season with the Rebels and had a 2-1 record when he was assigned to the Hot Springs Bathers of the Cotton States League. He regained his form at Hot Springs and led the pitching staff with a 17-6 record (league leading .739 winning percentage) and 3.00 ERA. On July 15, he combined with Vicksburg hurler Alfred Kelly to defeat Helena in the Cotton States League All-Star game. His outstanding year saw a jump to the Nashville Vols of the Class A1 Southern Association, but after five appearances and a 0-2 record (including a defeat to Paul Richards’ Atlanta Crackers) he was assigned to the Charleston Rebels of the Class B South Atlantic League in May. Pescod was 11-13 with the league-winning Rebels and had a 2.98 ERA. With the disbandment of the South Atlantic League after the 1942 season, Pescod was sold to the Portsmouth Cubs of the Piedmont League and assigned to the Erwin Aces of the Class D Appalachian League for 1943. He was the most talked about player at spring training, and club president H. H. Spears, used the veteran hurler to work with the team’s youngsters during April. But the 1943 season never arrived for Pescod. The 27-year-old was in military service when the opening day cheers were heard from the bleachers of Erwin Aces ballpark. In 1944, Pescod left his wife Elizabeth (nee Cook) and their daughter, Charlotte Anne, at the family home in Dumas, Arkansas (he had worked during the off season as physical director for the Boys Club at Hot Springs) to serve with the U.S. Army. After receiving basic training at Camp Roberts, California, he went overseas in May 1944 to Europe with Troop A, 121st Squadron of the 106th Cavalry Group, which acted as the eyes and ears of the army, using their jeeps and M8 armored cars to scout ahead of slower units and seek out the enemy. The group first entered combat in France on July 4, 1944, mopping up enemy forces that had been cut off in the Normandy peninsula. In late 1944, the group was executing a delaying action against the 130th Panzer Division in northeast France, when Private Pescod was killed in action on December 2, near Eckartswiller, France. The 30-year-old was buried at a temporary U.S. military cemetery at Hochfelden, France. In 1965, Pescod was the first recipient of Cristobal Higfh School's Gibson Memorial Award (presented to the school in memory of Noel E. Gibson, former faculty member) as he was inducted into the Cristobal High School Hall of Fame. His name appears on the Desha War Memorial in Desha County, Arkansas. 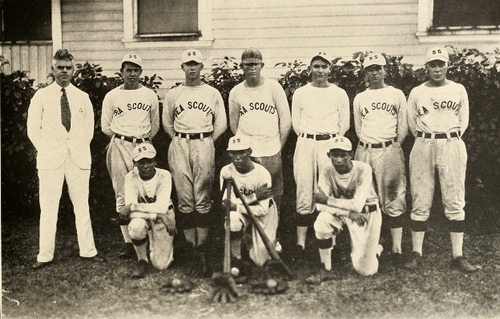 The 1930 Cristobal High School baseball team played as the Sea Scouts in the Twilight League. They lost in the playoffs that year to Balboa High School. Charlie Pescod is front row, first left. His brother, Tommy, is in kneeling in the middle. Thanks to Jose Veiga Fittipaldi for help with this biography.